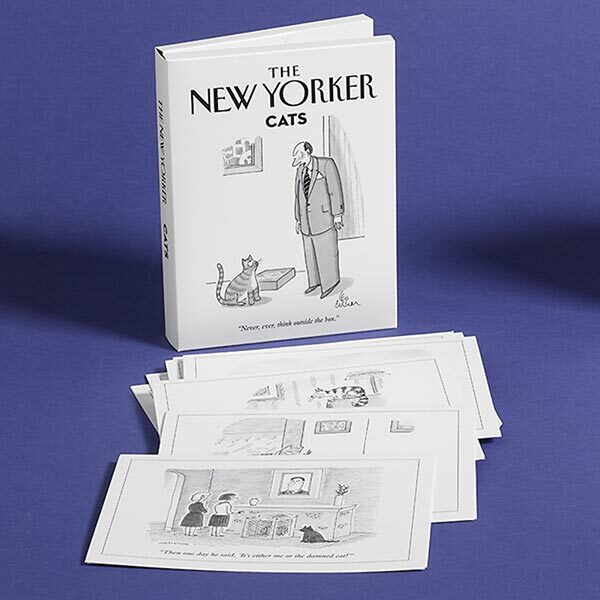 Mail your friendly greetings with sophisticated humor via our droll note cards featuring hilarious cartoons from The New Yorker. With an image of a man speaking sternly to a kitty next to a litter box, one of the Cat cartoons is captioned "Never, ever, think outside the box." One Dog illustration depicts two pups on a walk, one complaining, "It's always 'Sit,' 'Stay,' 'Heel' - never 'Think,' 'Innovate,' 'Be yourself.'" Each set of 4½"x6¼" blank note cards includes two each of five different cartoons, plus envelopes.